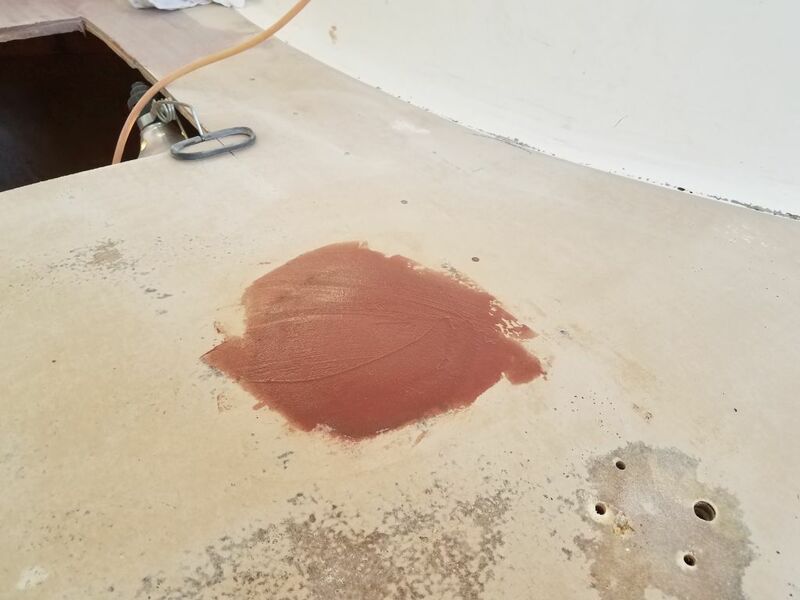 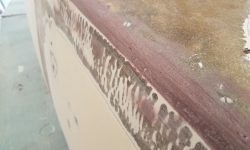 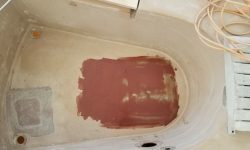 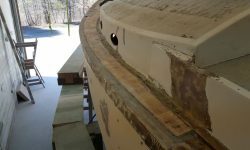 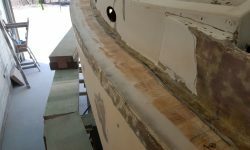 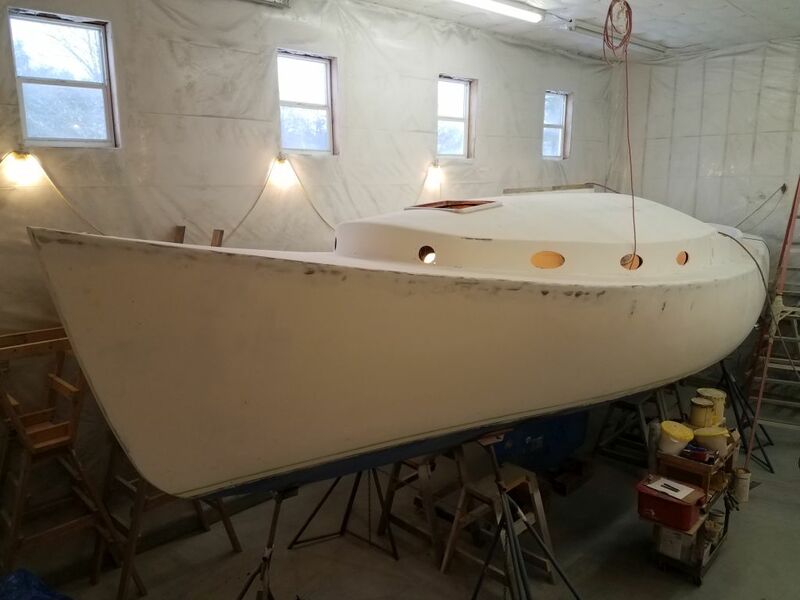 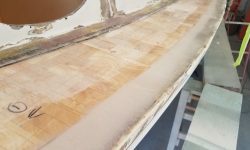 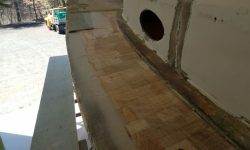 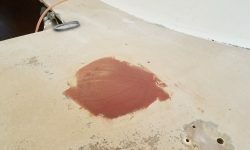 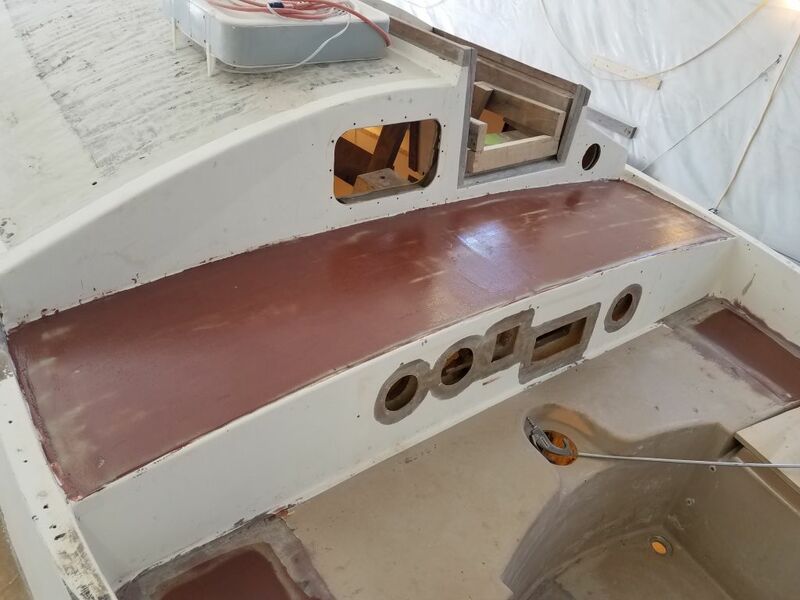 I began with my usual round of sanding, this time the new fiberglass on the bridgedeck and coachroof, and around the new core on the port sidedeck, along with portions of the hull/deck joint. 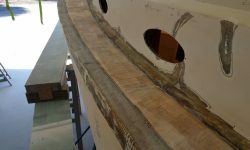 Some portions of the filled joint on the port side were now basically complete, with two applications of filler, and where possible I rounded the edge to the final contours. 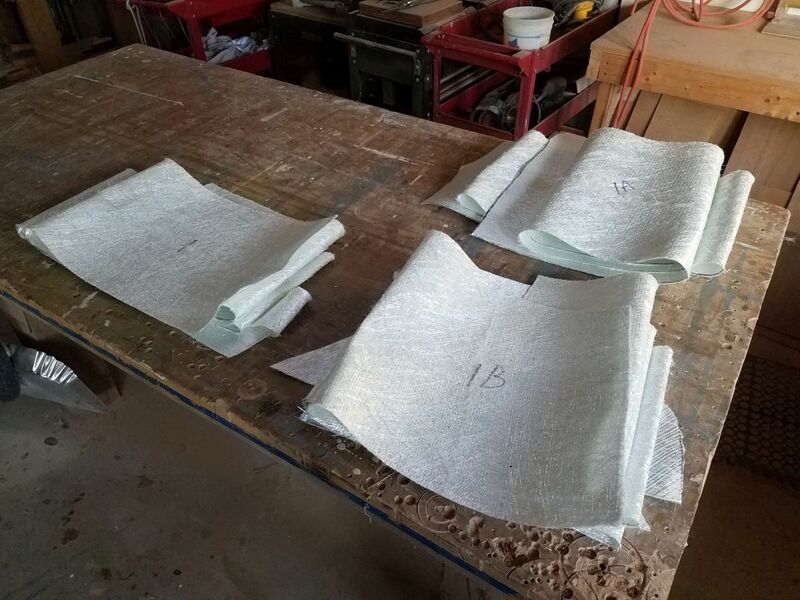 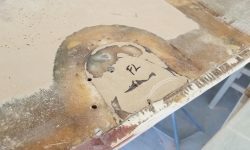 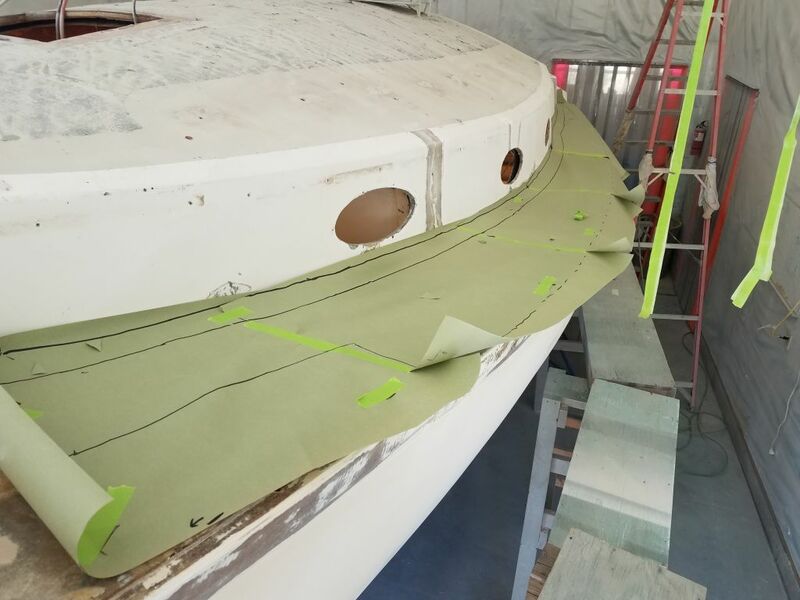 After cleaning up, I made a quick paper pattern of the port sidedeck so I could cut the new fiberglass a little later in the day. 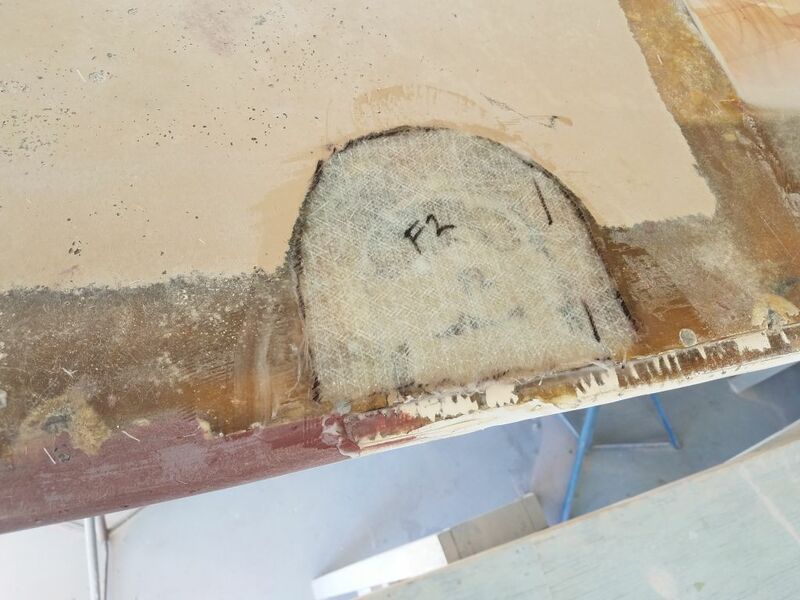 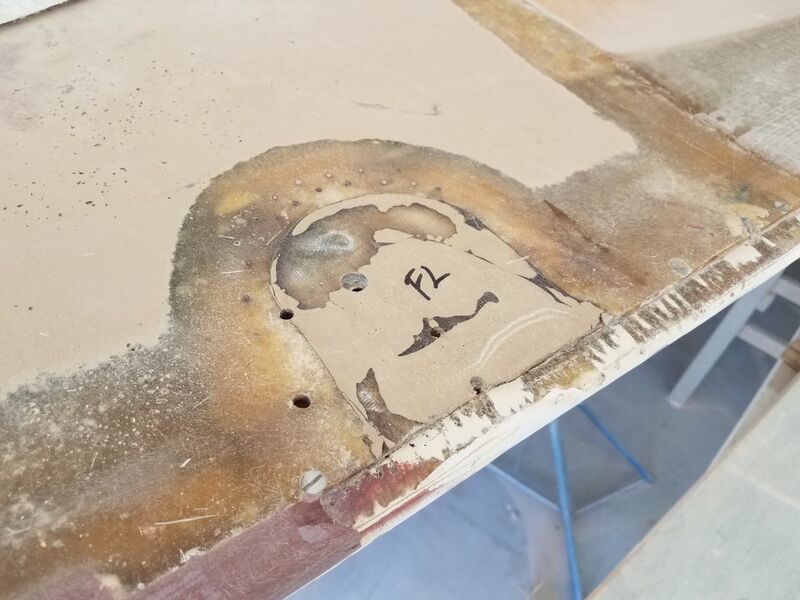 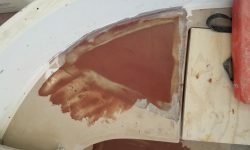 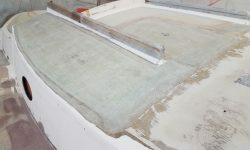 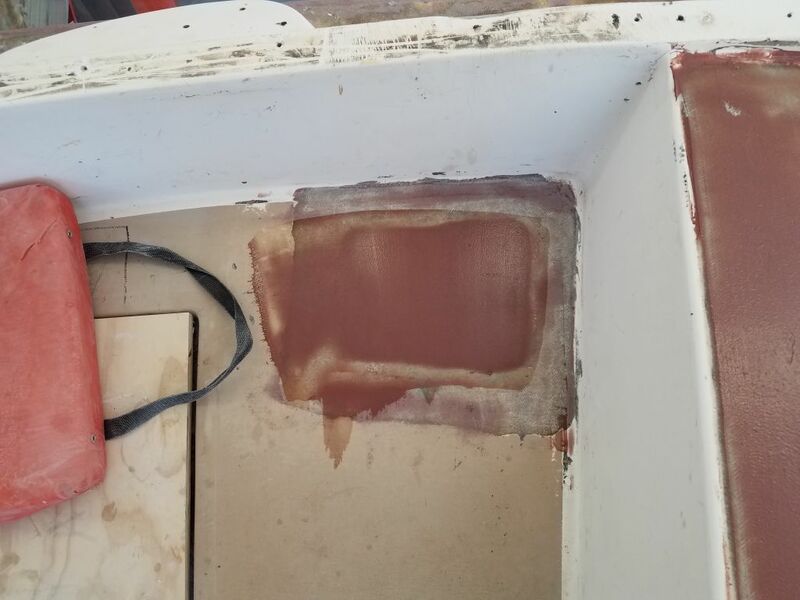 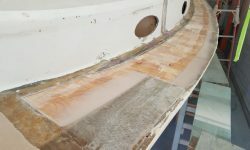 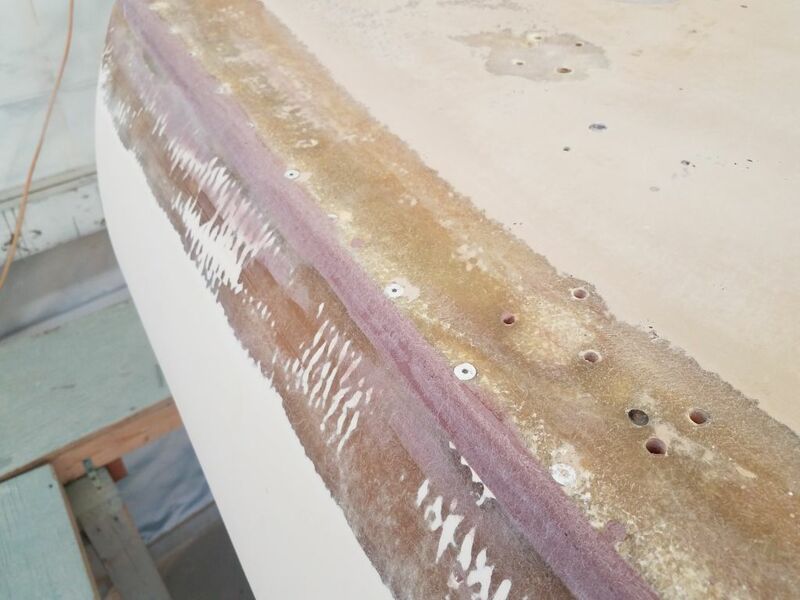 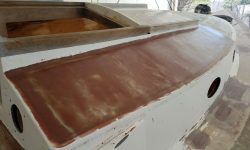 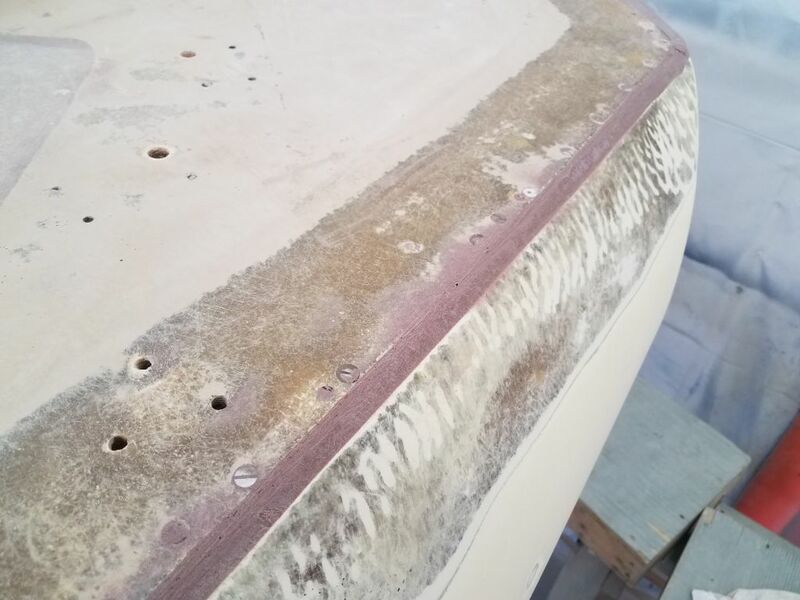 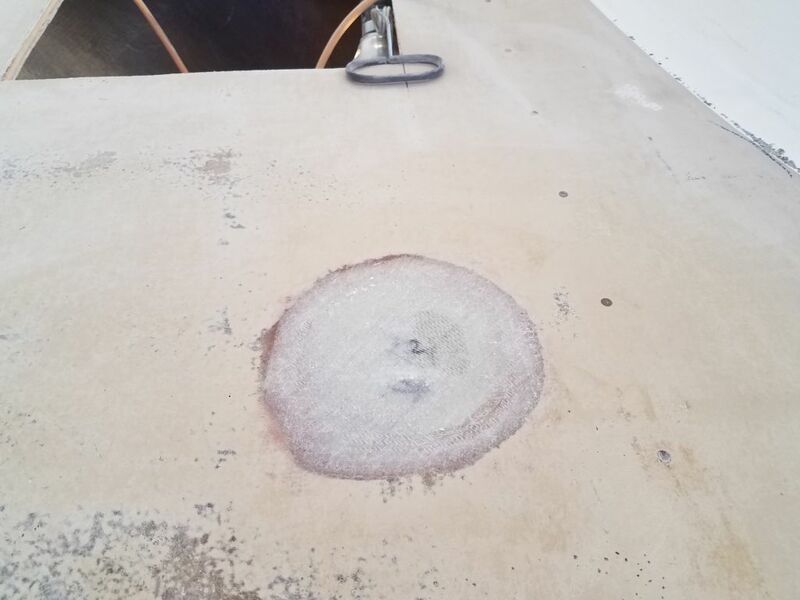 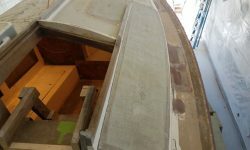 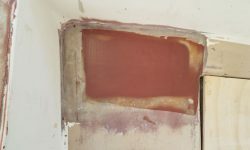 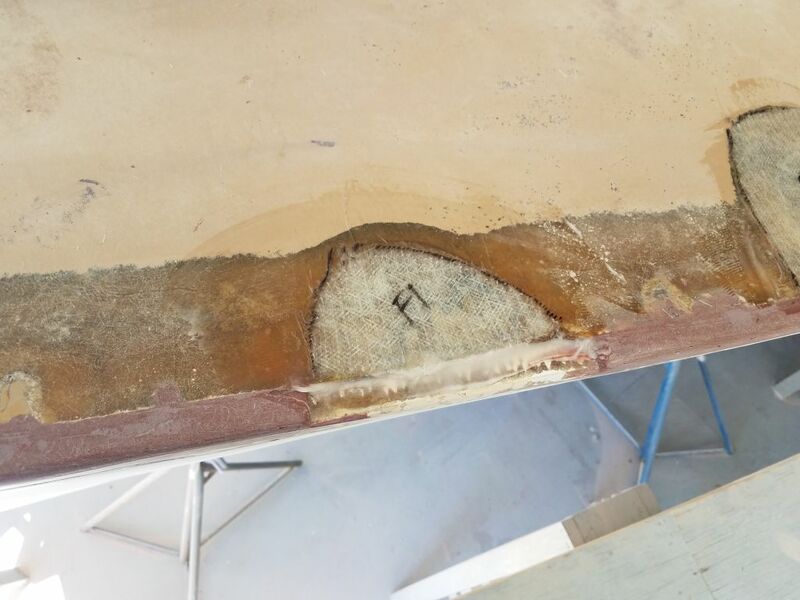 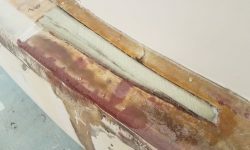 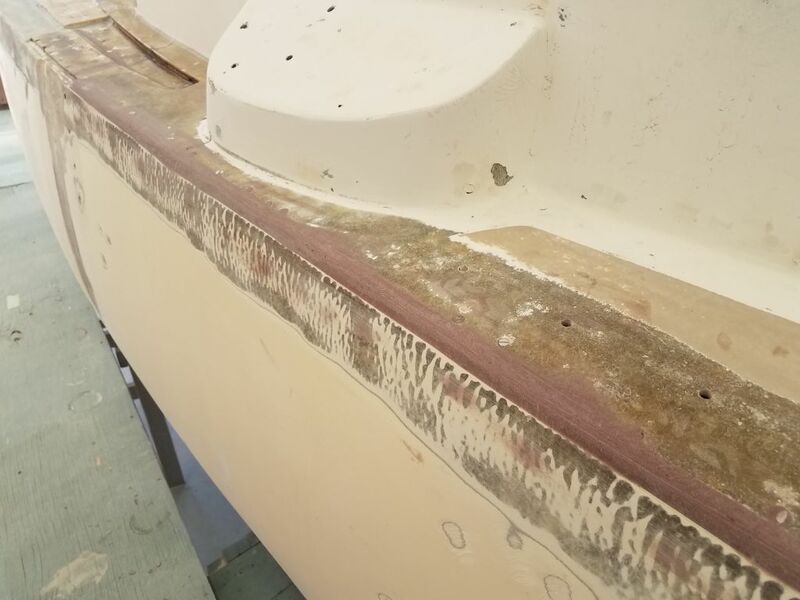 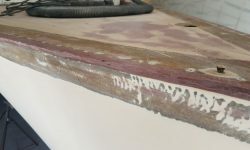 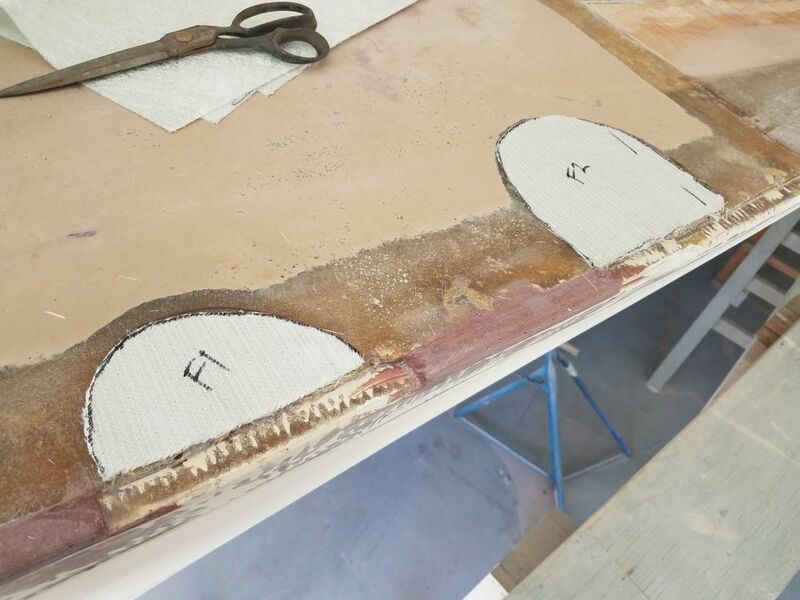 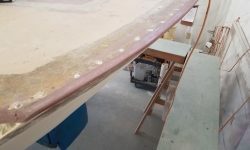 To provide a smooth transition between the edge of the new core and the hull flange for the new fiberglass, I used a mixture of epoxy with high-density structural filler to fill a small gap between the flange (which rose up a bit higher than the bottom skin laminate) and the top of the core. 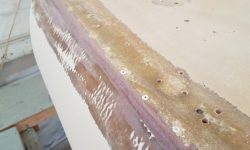 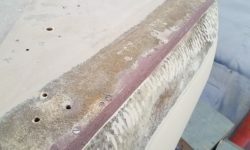 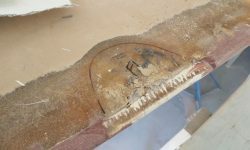 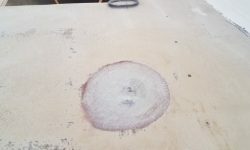 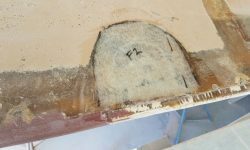 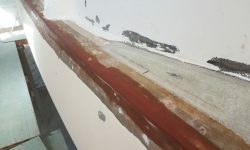 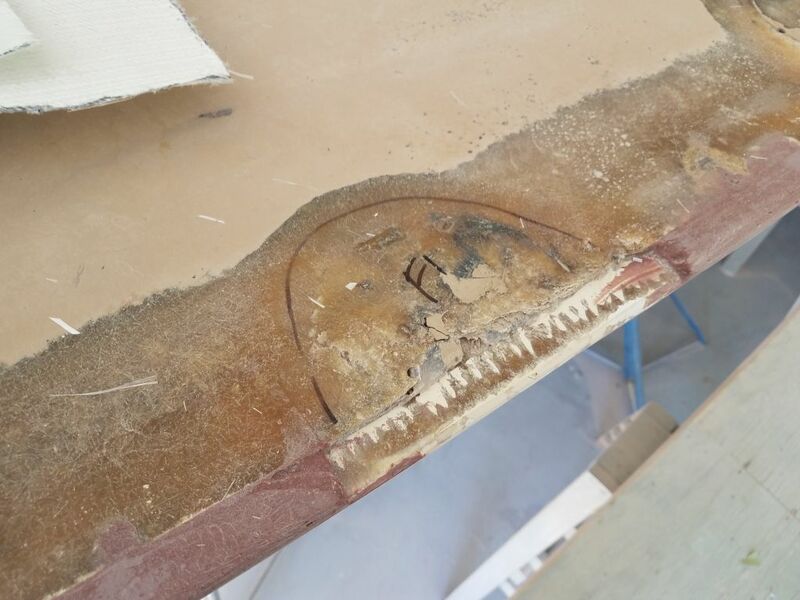 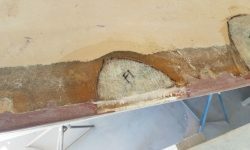 This also maintained a fair line from the edge of the existing deck flange (inboard) to the gunwale. 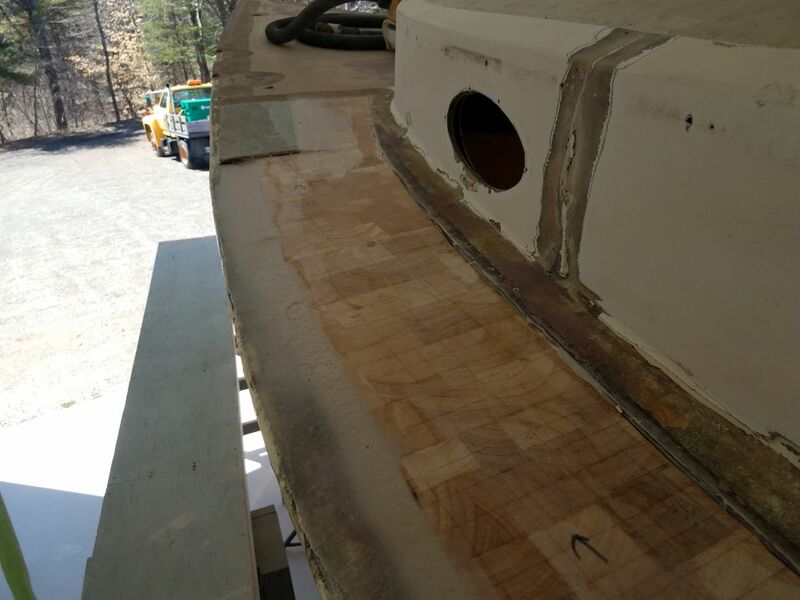 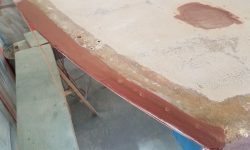 Earlier, near the port gunwale on the foredeck, I’d ground out a couple old and suspect repairs on the deck so I could add some new fiberglass. 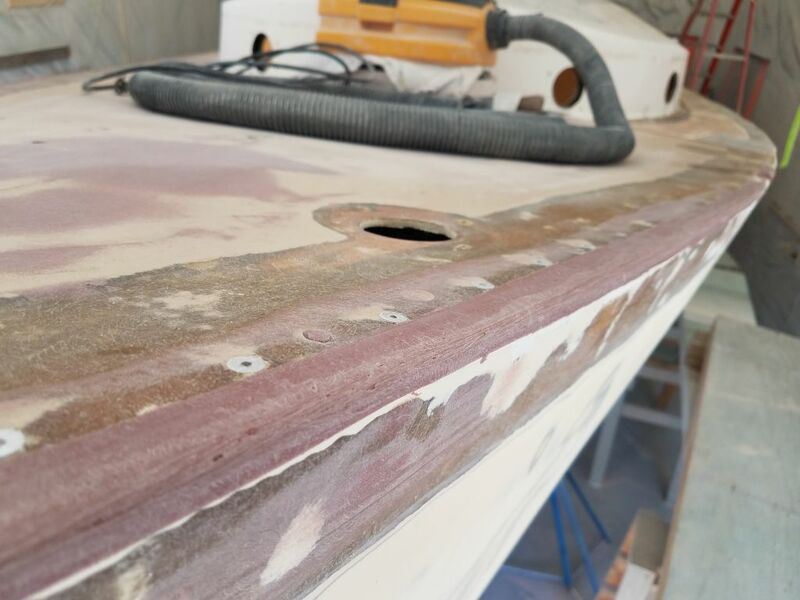 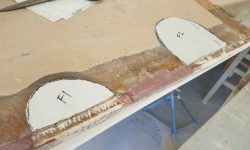 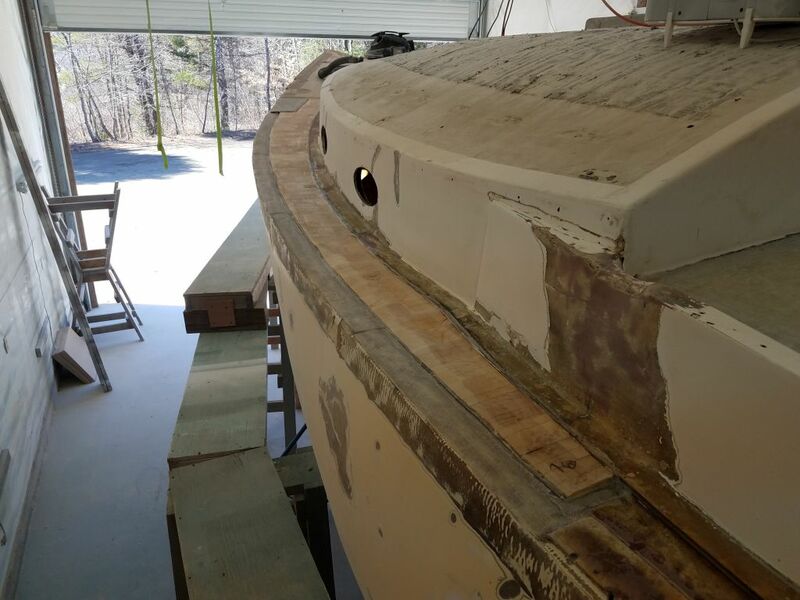 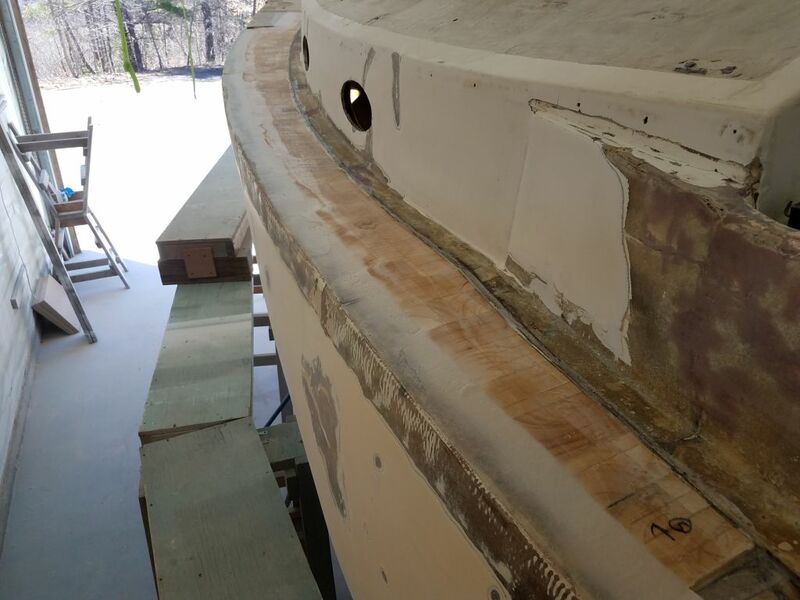 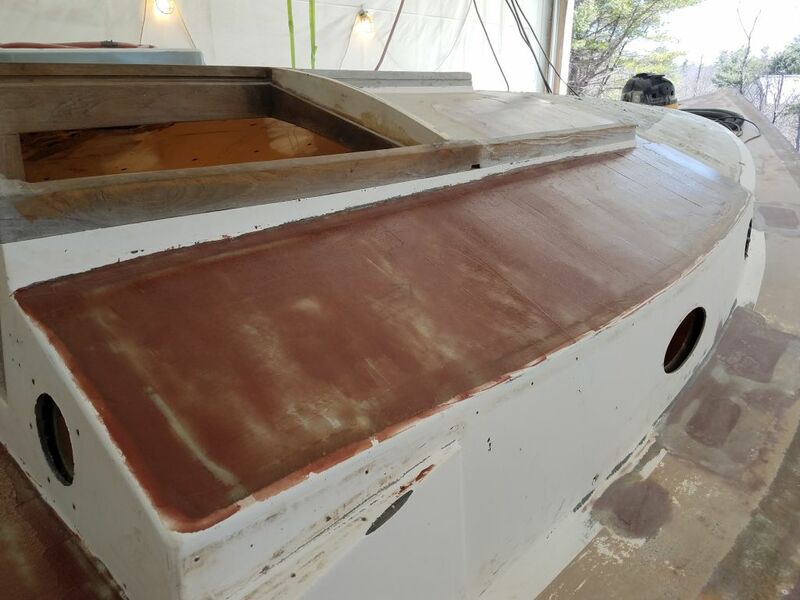 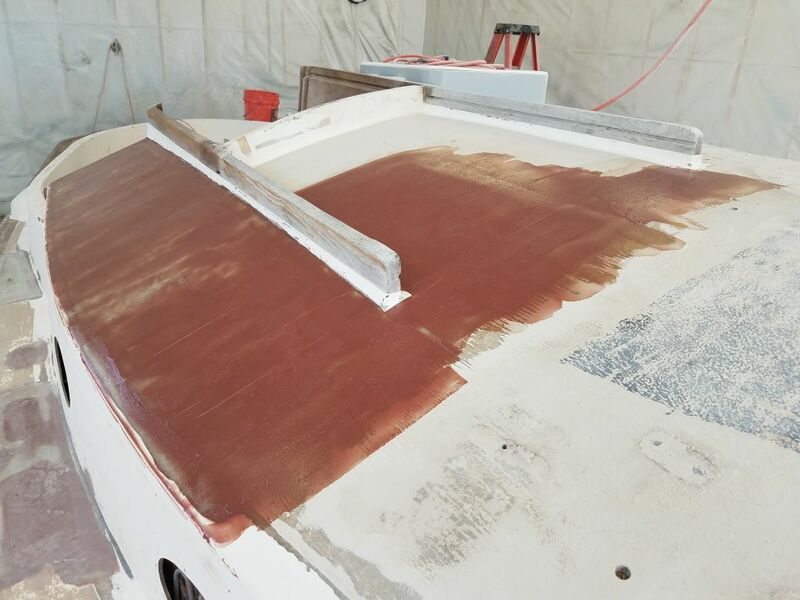 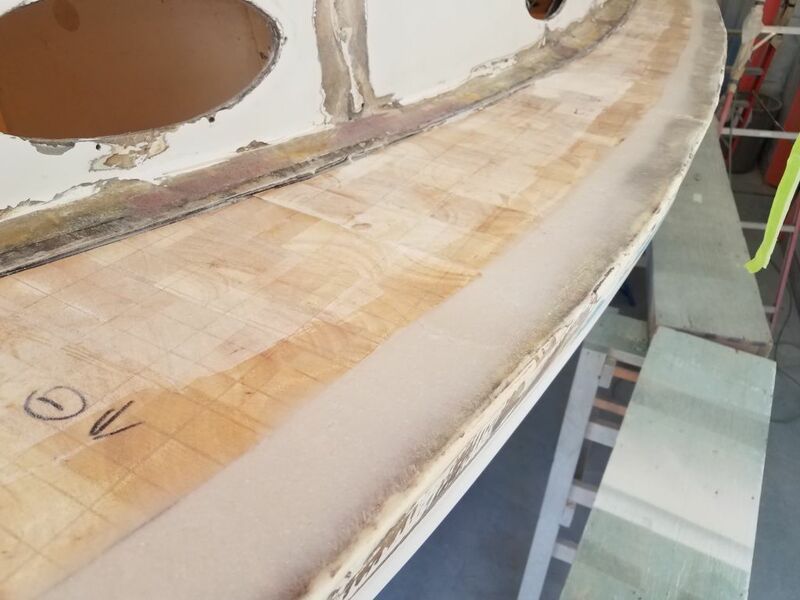 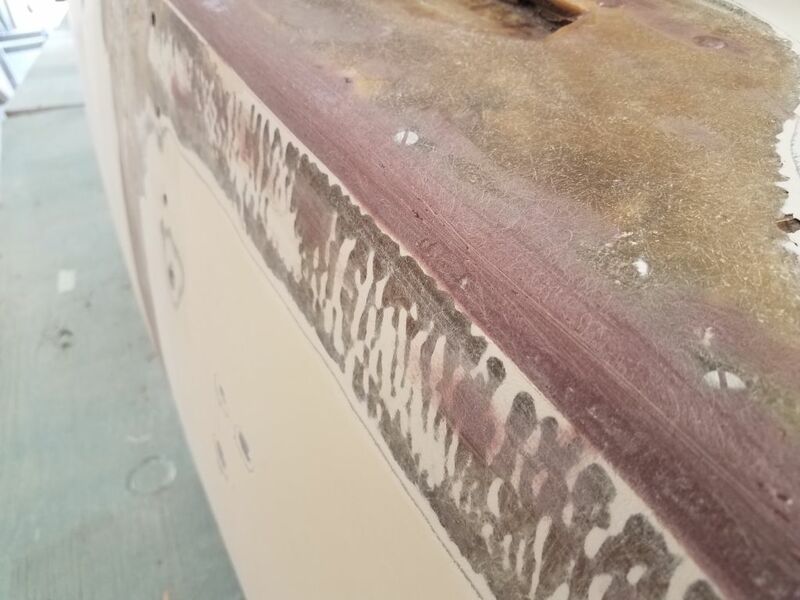 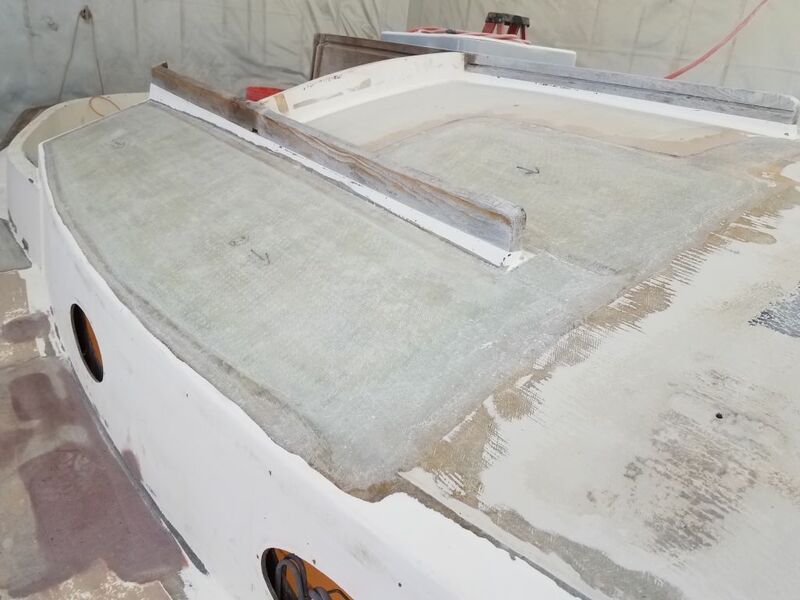 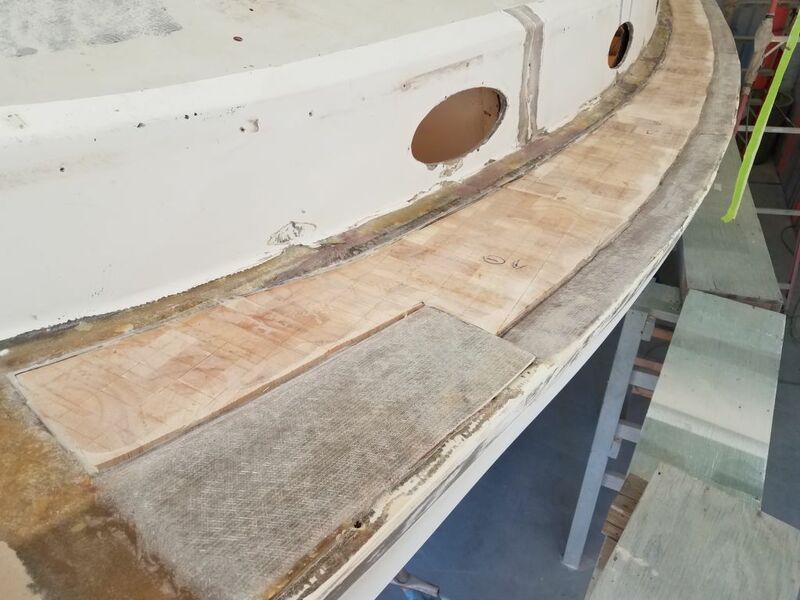 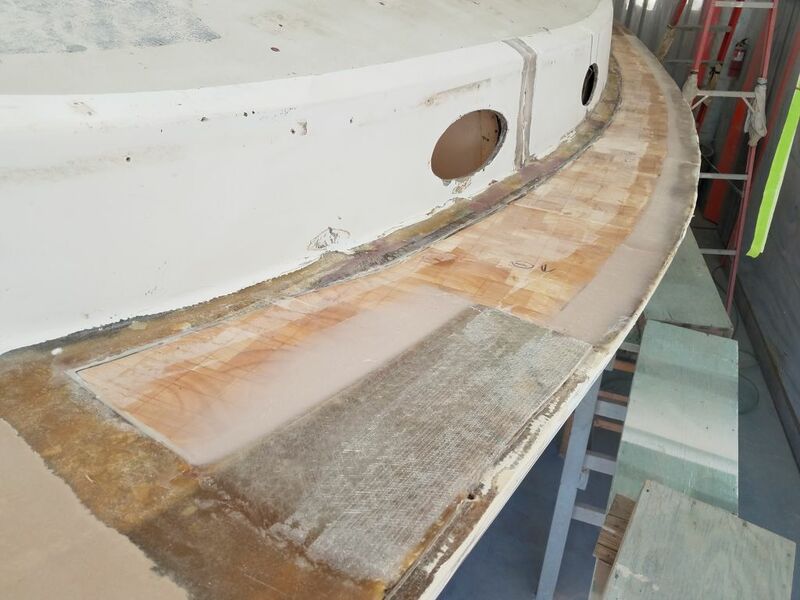 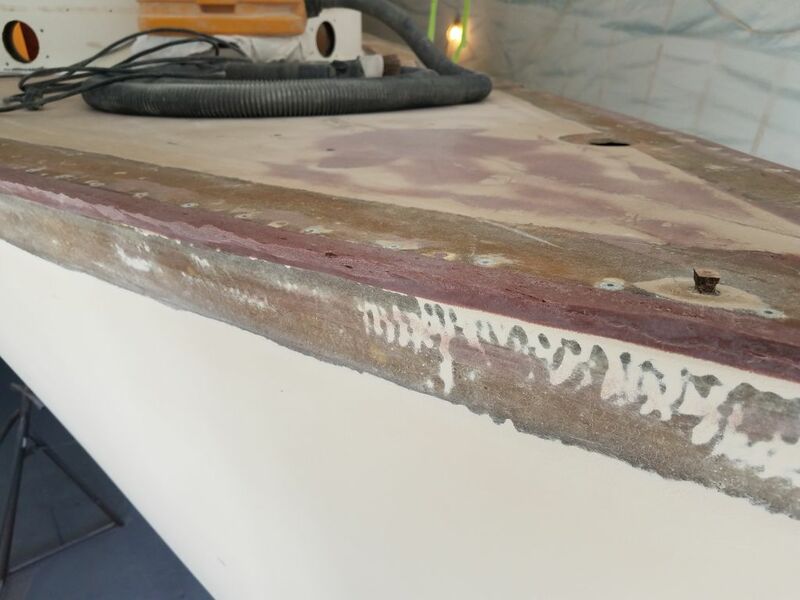 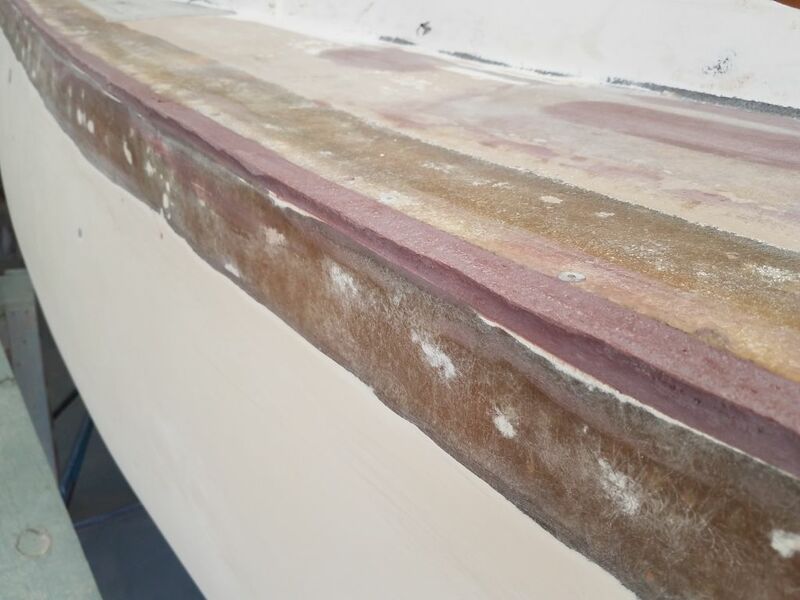 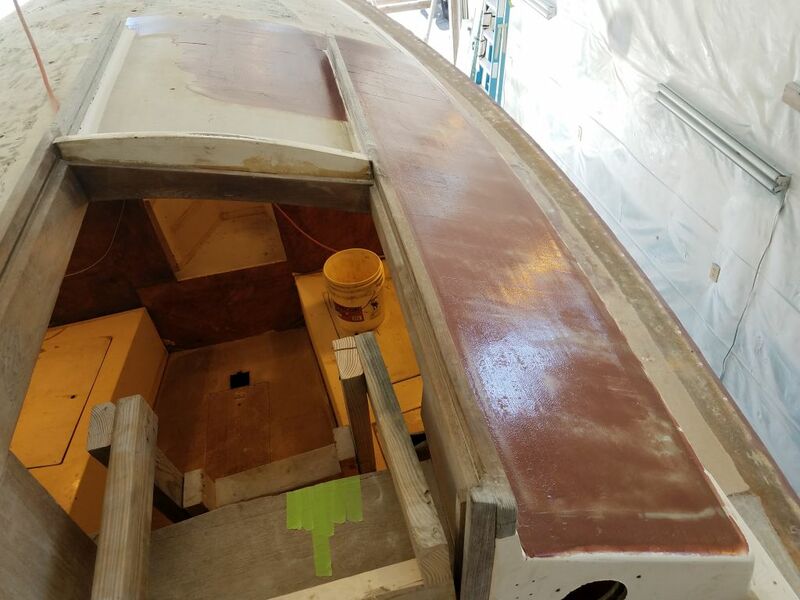 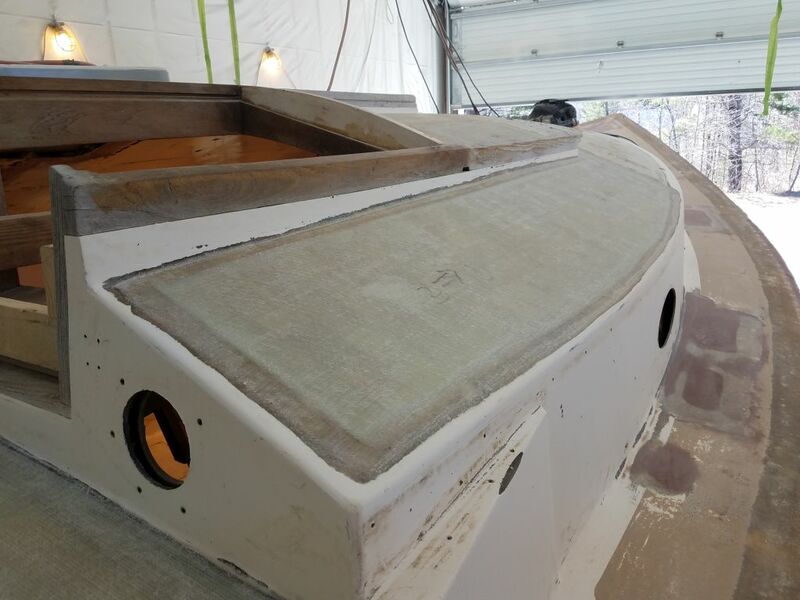 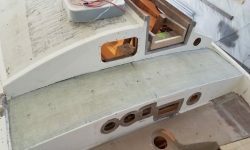 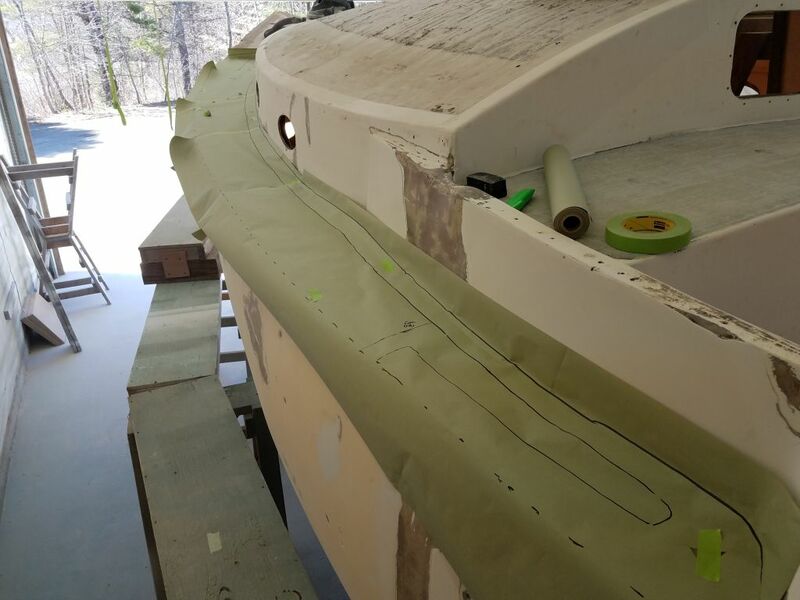 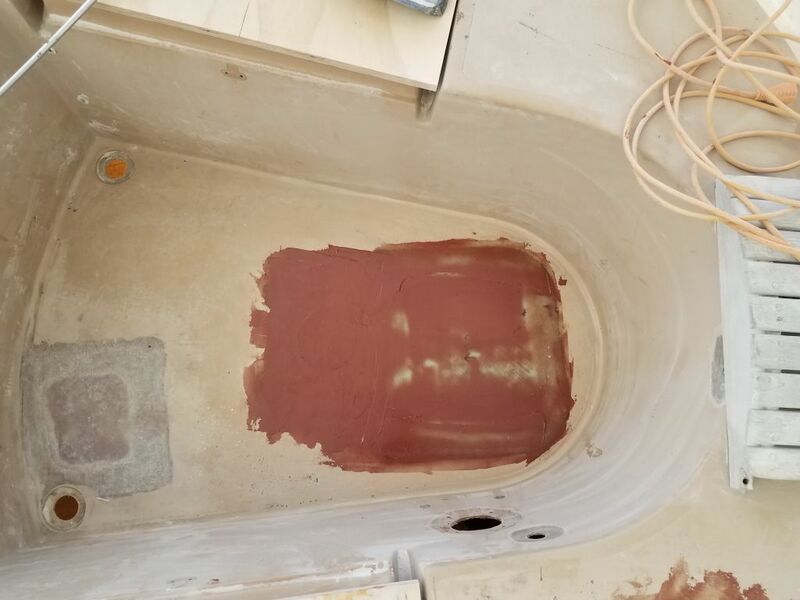 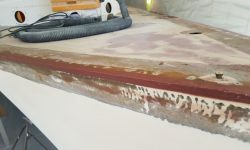 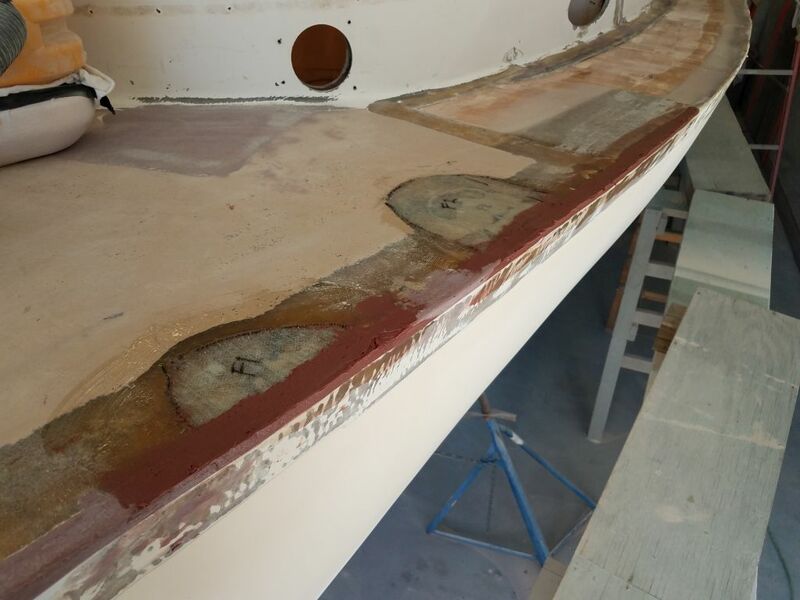 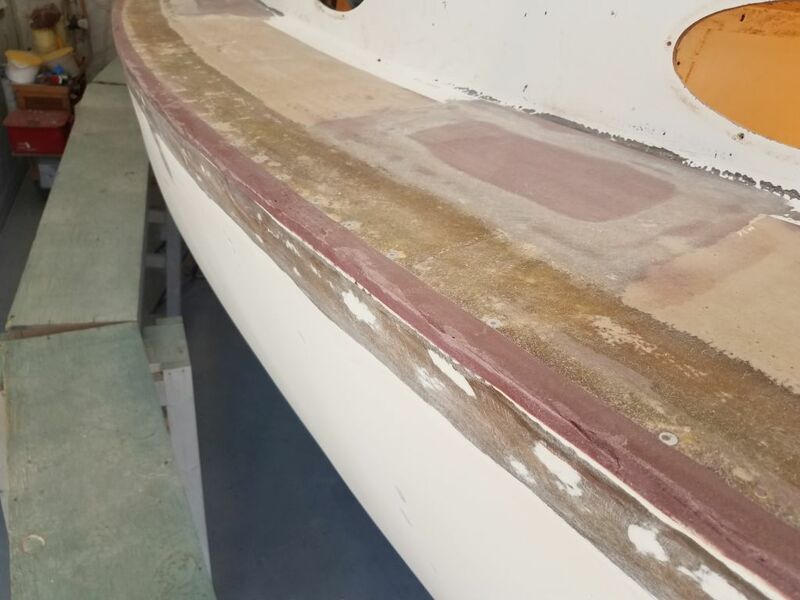 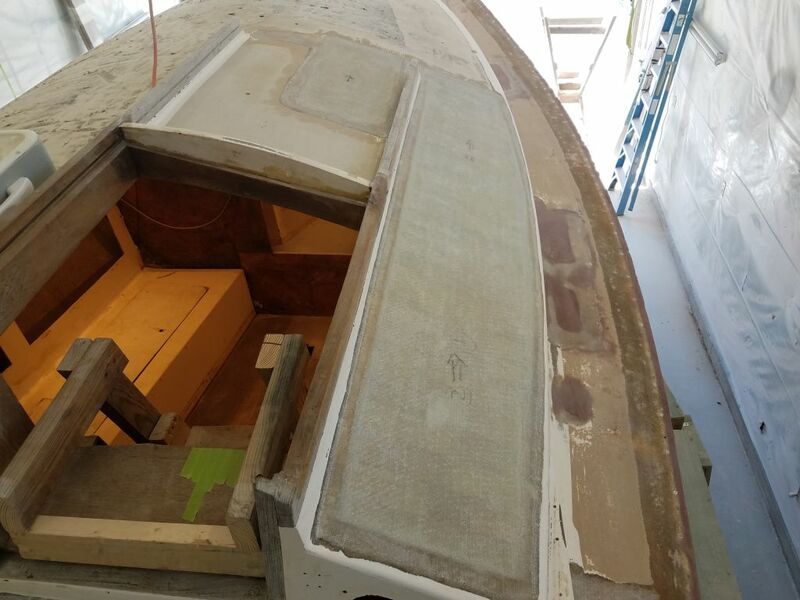 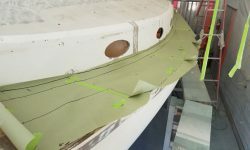 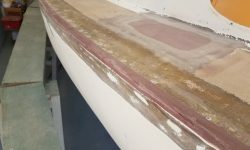 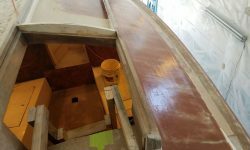 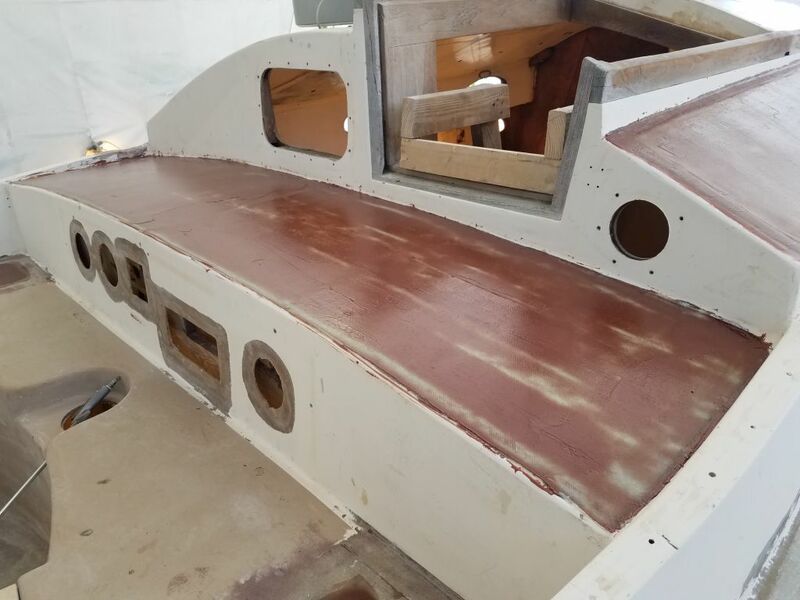 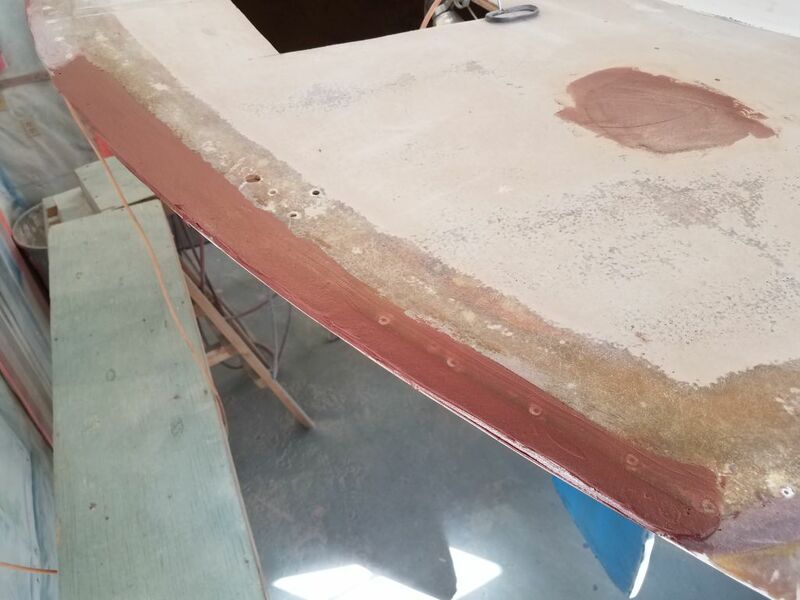 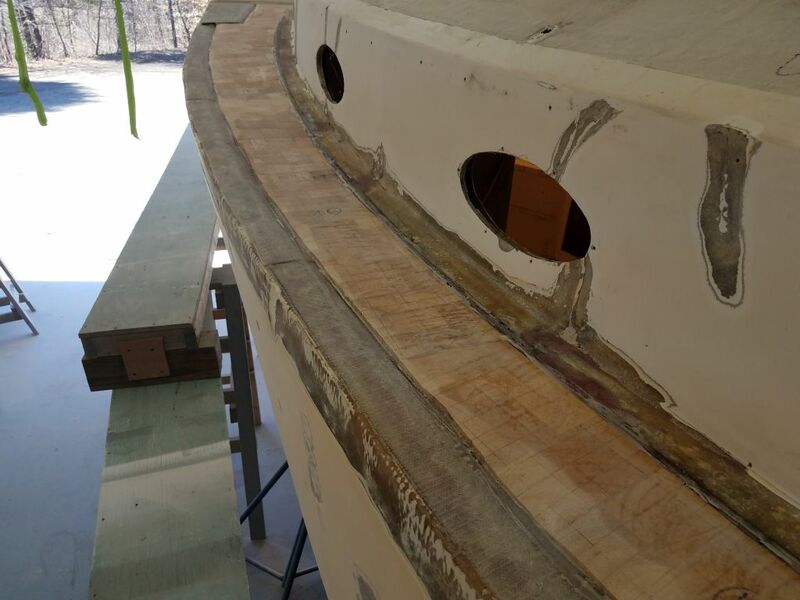 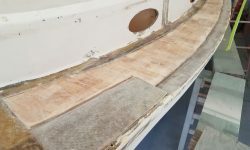 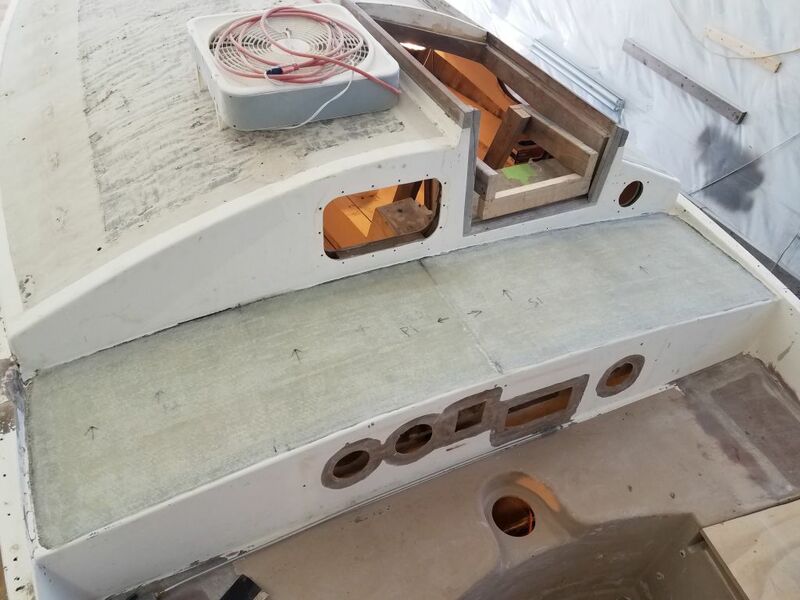 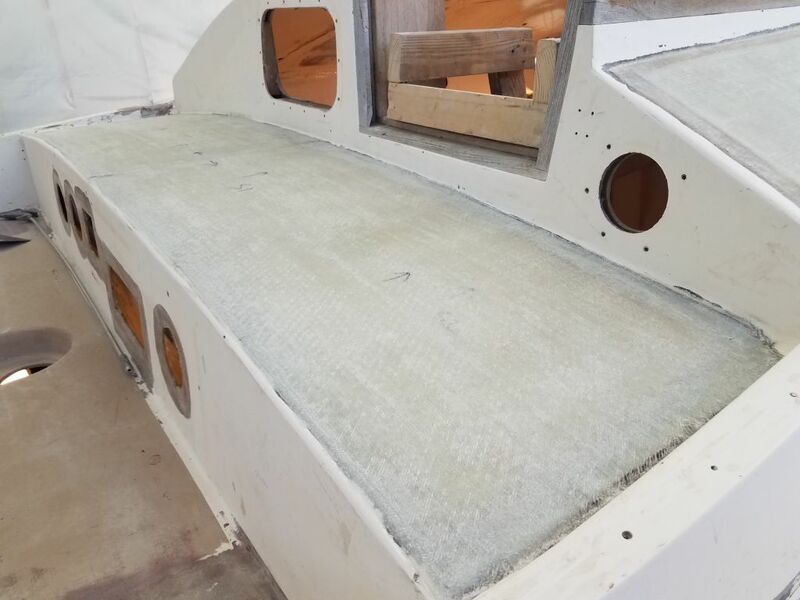 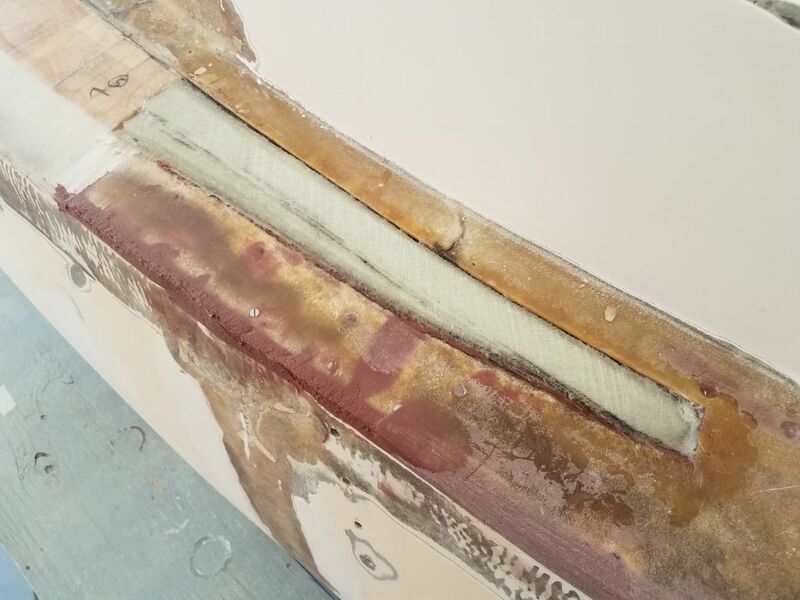 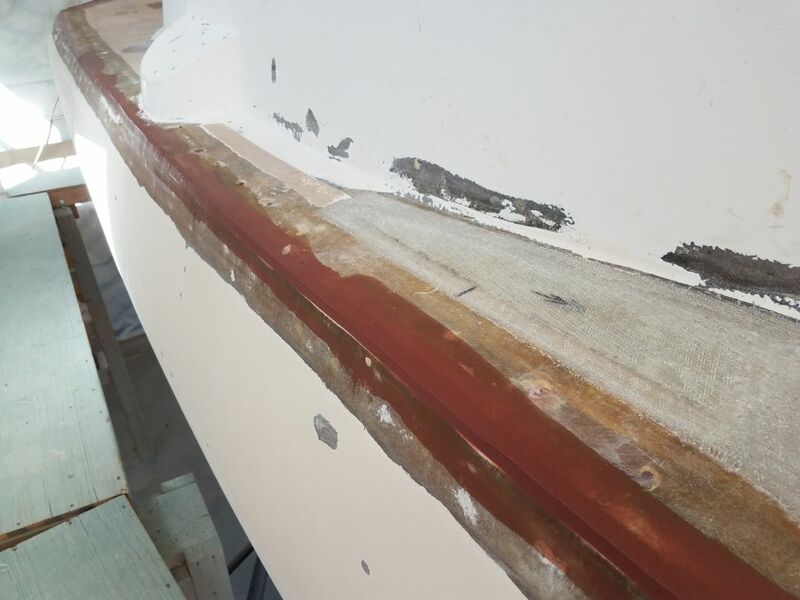 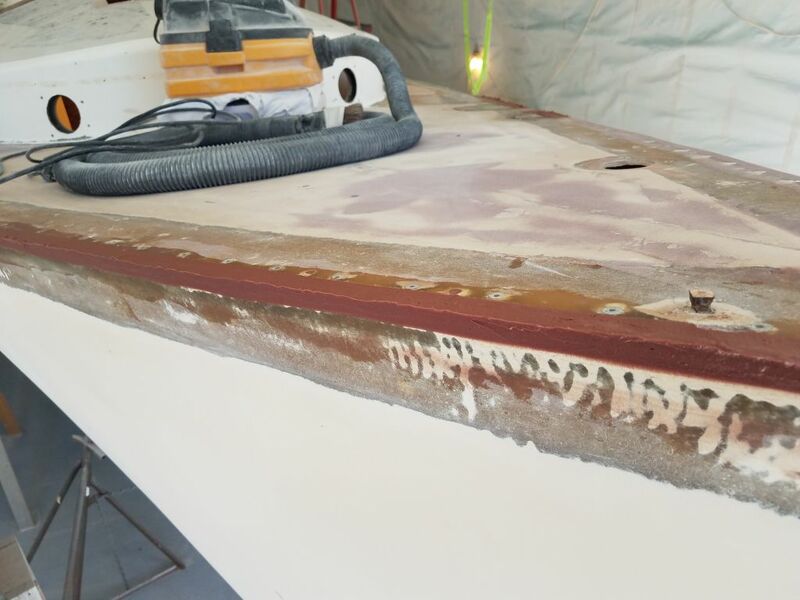 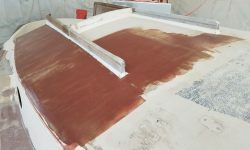 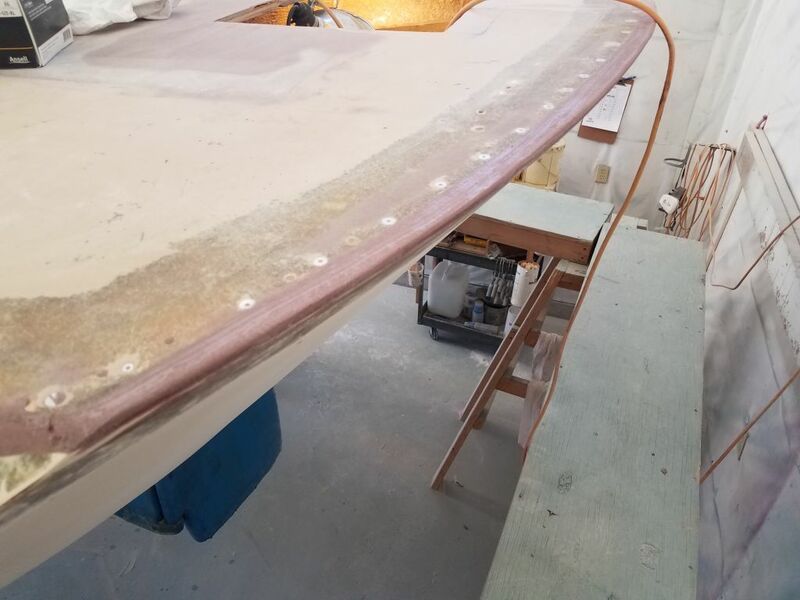 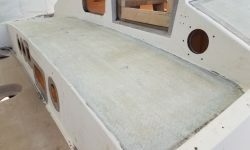 While I planned to incorporate these areas into the eventual hull/deck tabbing a little later, for now I wanted to add a layer of fiberglass to begin the buildup and allow me to fill the edge of the deck through these sections as well. 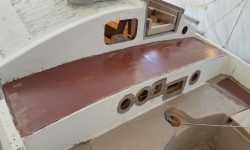 At the aftermost end of the port sidedeck was a small area outboard of the cockpit where I’d removed core earlier. 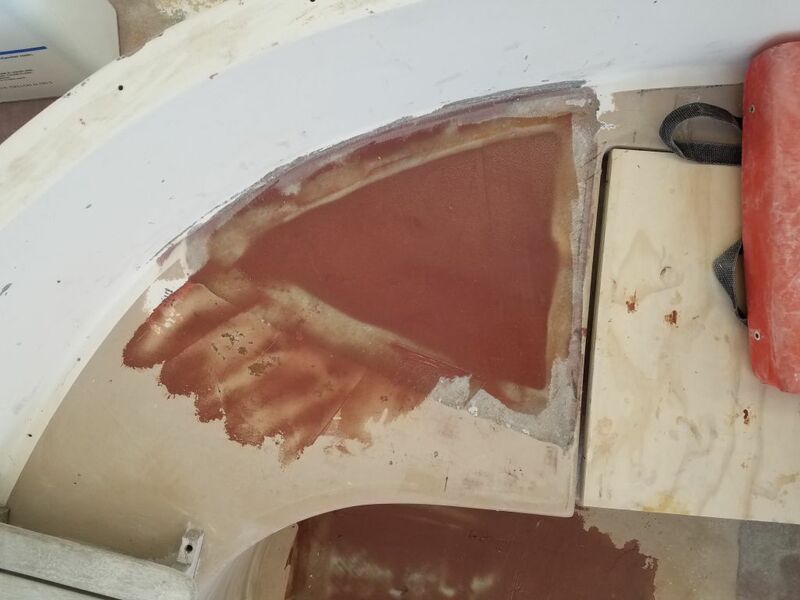 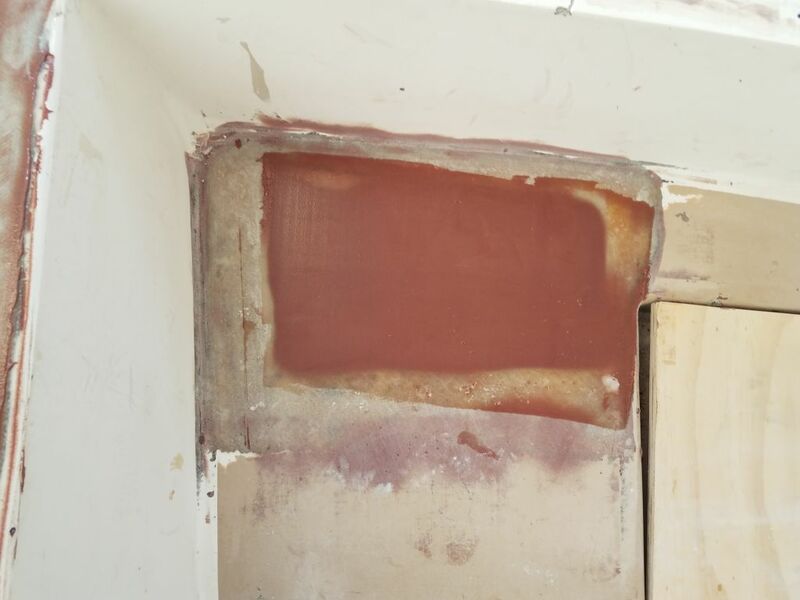 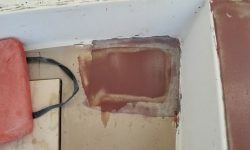 I’d decided long before to fill this tiny section with solid fiberglass, so with the core underway I went ahead and installed 8 layers of 1708 in the small space, spread out over two applications during the morning and afternoon. 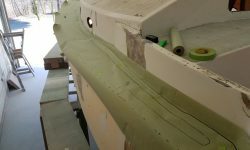 Next, I applied epoxy fairing compound to the newly-glassed bridgedeck and coachroof, the first coat to begin to fill the weave of the cloth as necessary. 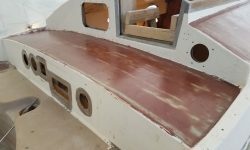 I also applied fairing compound to the last cockpit patch on the sole, plus the other areas that had only received one coat of fairing filler so far. 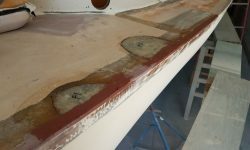 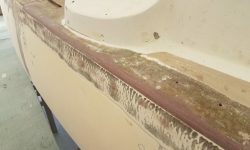 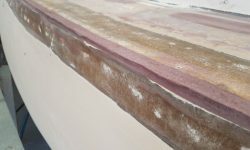 Most of the starboard hull/deck edge required a second round of epoxy filler, which I did now. 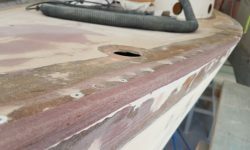 I used up extra in areas on the port side where I’d not previously filled, such as around the small repairs on the foredeck. 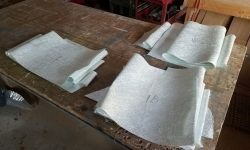 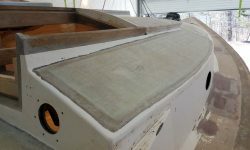 To finish up the day and prepare for next time, I cut three layers of 1708 fiberglass for the port sidedeck.